Heavy bag training is absolutely indispensable for any fighter looking to get into the ring or cage. From aspiring fighters to seasoned veterans, from boxers and kickboxers to Muay Thai and MMA fighters, one thing that unites all fighters in training is the amount of work that is put into hitting heavy. As a fighter, the heavy bag is your best friend. It is important; however, to make sure that you are using the bag properly in order to get the most out of your training and avoid injury. 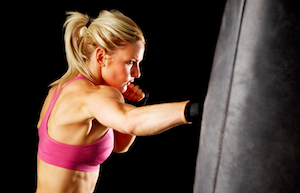 Below are 9 top tips on how to use a heavy bag (also known as a punching bag). 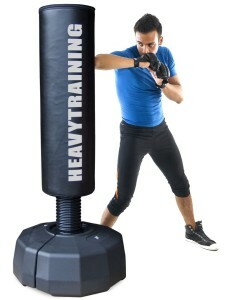 Also, if you want to pick up a good punching bag for training, make sure to check out our interactive heavy bag guide. Before you can use your heavy bag, you need to make sure that it is set up properly. Different bags are set up in different ways; some hang from chains or straps, while others stand freely, just requiring that their base is filled with water or sand. The most important part of setting up a bag is simply following the installation instructions. Don’t hang a punching bag from a beam that cannot support its weight. Also, try to ensure that there is enough space for the bag to swing freely without hitting walls or other training equipment. Ideally there should be enough space for you to be able to circle the entire bag, although this isn’t totally necessary. Keep your training space clear of clutter or tripping hazards. If you are looking for a very good free standing heavy bag, make sure to check out our Century Bob review. This is an important step that is frequently missed. Before you use a heavy bag, it is important that you get your heart rate going and warm your muscles up. This serves to avoid injury and also prepare yourself neurologically for your punching bag routine. We suggest 5-10 minutes of skipping rope to get your blood flowing, and a couple rounds of shadow-boxing to mentally reinforce your technique. We cannot emphasize this enough. Make sure that you protect your hands before any heavy bag workout. Wrap your hands with cloth or gauze hand-wraps, and wear proper bag gloves. Heavy bags are often packed very tight, and a stray punch without protection could lead to a serious knuckle, hand or wrist injury. This is a very amateur mistake, and not one that you will make twice. When hitting a training bag, it is important to have a pre-established goal in mind. Swinging wildly as hard as you can for 30 seconds and then gasping for air will not help you become a better fighter. Having a specific goal in mind for what you want to work on in your heavy bag session will. For instance, today I am going to work on speed, or today I’m working footwork into my combinations, or today I am going to work on my power shots. You can work in sets (50 1-2s, 50 kicks with each leg, and so forth), or you can work in timed rounds, whichever lends itself to better training your goal effectively. When hitting a heavy bag, it is important to look where you are throwing. Don’t look at the floor, or worse look at yourself in a mirror. Your technique will suffer and you run the risk of injuring yourself with a mistimed or poorly aimed shot. Think of it like driving, you wouldn’t drive in one direction and look in another. Make sure to hit the punching bag from the correct range. Don’t smother you technique by being too close to the bag. Don’t shorten your punches or kicks. Likewise, don’t try to hit the bag from too far away, as this will also hinder your technique, causing you to overextend or lean on your punches, or land your kicks with the delicate bones in your feet instead of your shins. Work from a range that allows for full, proper extension and thus maximal power development. A lot of people who don’t know how to use a heavy bag try to jump right to advanced techniques. However, successful fighters need to have a good foundation built up. Thus, in order to be a successful fighter, you must reinforce your basic technique on the punching bag through seemingly endless repetition. If you were to ask a top level professional boxer how many times they have thrown a jab on a bag, they would give you an answer in the tens of thousands. The same is true for a Muay Thai fighter and their round kicks. Just as you cannot play hockey without the basic foundation of ice skating, you cannot fight effectively without having a basic foundation. So, work your basics, work your basics, and then work your basics again. The seemingly endless repetition of hitting a bag can at times feel like a monotonous boring grind. However, make sure that you stay focused on the task at hand and keep your pre-established goal in mind. Keep your eye on the bag, metaphorically speaking. That is to say that you need train deliberately and not to let your mind wander to other things. Stay focused. This will help you develop your mental toughness, which is an important part of being a successful fighter. Don’t get lazy and be mindful of not cutting corners with your technique. Heavy bags do not hit back, and if you repetitively cut corners (such as holding your hands low), you might end up developing openings that a future opponent could capitalize on. If you need it, try asking a training partner or coach to help motivate you to stay on task, to keep drills fresh and interesting, and to keep an eye on your technique. Make sure to always cool off after an intense training bag workout. Drink some water to rehydrate and let your heart rate return to normal. We always advise doing some stretching afterwards. Hopefully this guide has been useful and provided you with some tips on how to use a heavy bag properly. The best way suggestion we have is to get started training with the basics and the rest will follow. Click to see some exciting heavy bag drills. Have fun and practice safely! Muay Thai has its roots in the techniques of Muay Boran, a 2000 year old Thai military martial art. In the 1920s Muay Thai evolved into a formalized sport, with Western style boxing gloves, boxing ring, and timed rounds. Today it is widely considered to be one of the most effective methods of stand up fighting, and is a mainstay in MMA fighters’ training camps. Finding a good Muay Thai heavy bag is essential for training, but with so many different heavy bags from various brands it can be a challenge to find the right one. 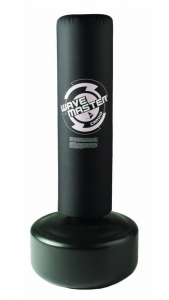 In the article below, we review 4 of the top Muay Thai punching bags from major MMA brands like Ringside, Outslayer, Combat Sports and Title. Make sure to read the reviews before purchasing your next Muay Thai bag. The Ringside Muay Thai training bag is tall and slender, with a 70 inch height and 13 inch diameters The bag weighs 100 pounds when filled and comes in a dark black color with a Ringside logo on the upper front. The bag is constructed from top grain cowhide leather, with a once inch foam liner. This liner gives the bag a cushioned, worked in feel directly out of the box, which helps to prevent hand injury. The heavy filling prevents the bag from swinging wildly, which can be an issue with longer heavy bags. The cowhide is exceptionally durable, and ensures that the bag will retain its shape even after repeated blows. The top of the bag remains dense, while the bottom remains forgiving, which is important for aspiring Muay Thai or MMA fighters, as it prevents injury while perfecting the devastating Muay Thai low kick. It comes with a chain and a swivel, allowing for multiple hanging options. Ringside’s Muay Thai bag was clearly designed with MMA and Muay Thai fighters in mind. We would not recommend this bag for a fighter who is training to compete under a rule set that does not allow low kicks, as they would simply be better off with a traditional western boxing punching bag. It would suffice as an aerobic fitness bag because of its relative softness, but does not hold any clear advantage over other aerobic heavy bags. Ringside’s bag is a well designed, comfortable bag that will stand up to heavy use and is a necessity in any Muay Thai or MMA gym. 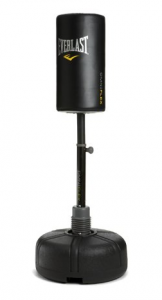 The Title Classic Banana Heavy Bag comes in at 72 inches long and has a 14 inch diameter. The bag weighs 100 pounds and is notable for it’s rich red color (black version is also available). The bag is constructed with high-quality triple-layered synthetic leather, making it very durable. It is packed with a foam liner, which feels great when hitting it and also adds to the bag’s stability. The bag comes pre-filled with resistance fiber, which prevents the bag from warping and the filling from settling to the bottom. All Muay Thai style bags have the tendency to swing when not anchored to the ground because of their unique long and skinny dimensions. However, while the Title Classic Banana Heavy Bag does swing, it is less than many other Muay Thai punching bags. The bag is packed very tight and can be a little harder than some other bags, but it is by no means rock hard and should work in a little bit after considerable use. 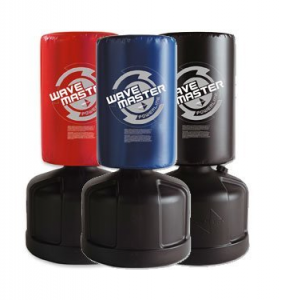 The bag provides significant resistance and is ideal for developing power in all Muay Thai techniques, especially kicks. Hand protection should always be worn while punching this bag. Similarly, kicking with an unconditioned shin might prove somewhat unforgiving. Because of this, we would not recommend this bag to aerobic fitness users as it might be too hard for recreational use. 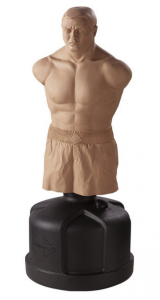 We would, however, recommend this bag more for advanced MMA and Muay Thai fighters who have built up some conditioning in their shins and need a long lasting, durable Muay Thai punching bag that won’t warp or break down when hit hard. 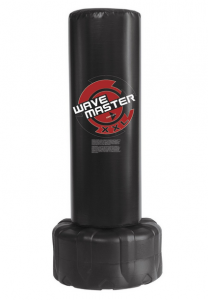 The Outslayer Muay Thai Punching Bag measures 72 inches in height with a 14 inch diameter, and weighs a very heavy 130 pounds. It is constructed from heavy duty vinyl. This bag comes filled with compressed fabric, as opposed to sand, which prevents settling and empty spots (there is also an unfilled option). This bag is not hung by a chain, but rather by 4 straps that are constructed from the same heavy duty material as the bag. 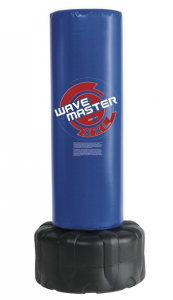 This punching bag is exceptionally durable and it should stand up to powerful kicks and punches for a long time. Outslayer stands firmly behind the quality of their product and offers a very good 10-year warranty. The Muay Thai bag is also designed to hold up to to 300 pounds without warping or breaking should you want to add extra weight. However, this should only by done by people very experienced in Muay Thai as 130 pounds is heavy enough for nearly any fighter to get enough resistance to develop power in their technique. This bag might be a little hard for aerobic fitness users, but we would definitely recommend it to MMA or Muay Thai fighters who are looking for a bag to blast day in and day out. The Combat Sports Muay Thai training bag is 72 inches in length and has the smallest diameter of any bag we’ve reviewed here at just 12 inches. This pre-filled bag weighs in at approximately 100 pounds and comes with a standard chain for hanging purposes. The bag is available in a dark black color and comes constructed with an outer layer of synthetic leather, which is designed to enhance durability. Because this bag is relatively light for its size, and lacks a foam liner to absorb power, it will have the tendency to swing quite a bit as it lacks the stability of heavier punching bags. It can be anchored to the floor to prevent excessive swinging if needed. 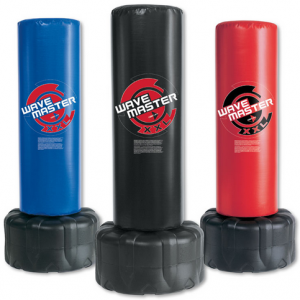 The synthetic leather material is forgiving, and feels more comfortable to strike with unprotected shins or knees than a punching bag made from canvas. 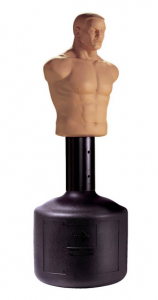 However, we still recommend wearing hand protection when punching this bag. The filling does seem to have the tendency to settle with repeated use, which could cause the bottom of the bag to become quite hard and the top to develop empty spaces. This can also lead to some warping around the center of the bag over time when kicked repeatedly with heavy power. This isn’t a major problem and one way of addressing these issues is to empty and re-fill the bag from time to time if needed. If you want to see even more heavy bags from popular brands like Title, Everlast, Ringside, Century and more, visit our heavy bag review guide. If you are interested, you can also learn more about Muay Thai here. Everlast is one of the best known martial arts accessory brands in the world. In fact, Everlast is often the first company that comes to mind for many people when they think of martial arts training gear. 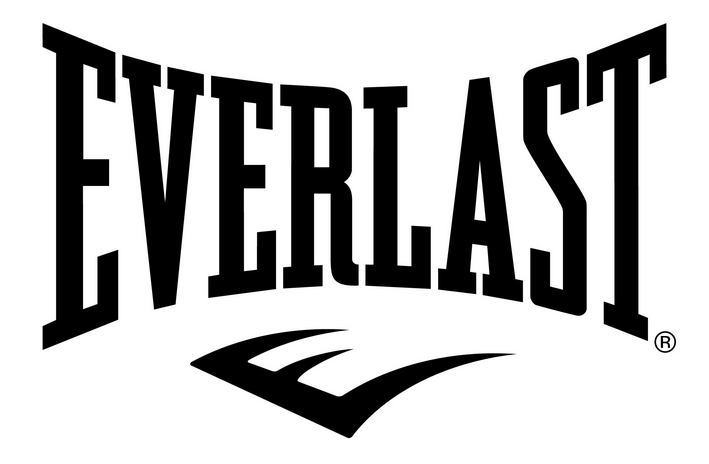 Everlast makes many great heavy bags and we review 4 of their top bags. 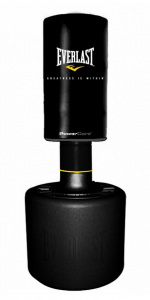 See below to get all the details you need before purchasing an Everlast punching bag. The Everlast Polycanvas Heavy Bag is a little lighter than many punching bags that you see in a boxing or MMA gym. This bag comes pre-filled with a specially blended filler mix of synthetic and natural fibers, which makes for excellent shock absorbency. This shock absorbency, and the fact that it is made out of highly durable synthetic poly canvas, means that it will last a very long time. There is quite a bit of give when you hit this bag, which is excellent for avoiding accidental injuries. This makes it a good choice for Muay Thai or MMA fighters who are working on their kicking technique as it would be more forgiving than a heavier bag with less give. However, it is important to always wear gloves while punching this heavy bag from Everlast. This bag comes with an adjustable chain and heavy duty nylon straps for hanging purposes. A hanging punching bag provides a moving target, which allows the fighter to work on their range and timing, as well as footwork and accuracy. The Everlast heavy bag is an excellent size for training children, as well as lighter weight fighters, as it provides little resistance. It is also ideal for recreational users who are not concerned with their power and just want to get a good workout. 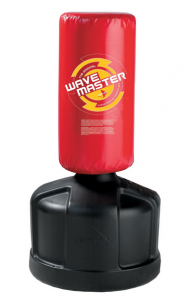 This Everlast punching bag is also good for wrestling practice and any kind of drills or activities that involve picking up and carrying bags over some distance. While this Everlast punching bag is great for recreational users, it isn’t really meant for either well-trained fighters or heavier people. This is because it’s a rather light punching bag, and so people with decent power will make the everlast punching bag swing around, which creates a poor training experience. Additionally, if you are trying to build up your power the polycanvas Everlast heavy bag is probably too light for you and you should look for a 100 pound bag. The Everlast C3 Foam Heavy bag is the type of bag that you might find in any boxing or MMA gym. The bag comes already filled with Everlast’s custom blend of synthetic and natural fiber. 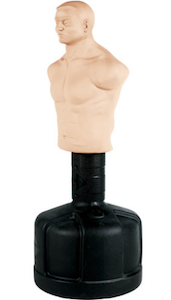 This provides a good deal of shock absorbency when both punching and kicking. 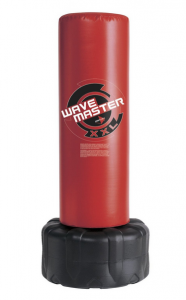 The Everlast punching bag is constructed from a webbed, interconnected matrix of synthetic leather and vinyl. It is wrapped by a layer of poly canvas that is filled with contoured closed cell foam, which helps to disperse the force of strikes while at the same time keeping the bag largely stiff while providing added durability. As a result, there is not as much give as the regular polycanvas Everlast heavy bag. This makes it ideal for high volume combination punching with an emphasis on speed, as it will remain steady and not swing wildly. 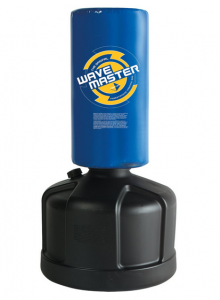 Fighters should ensure that their hands are sufficiently protected before punching the Everlast C3 Foam Heavy Bag with full power, as it is a very hard punching bag and could potentially lead to hand injury. 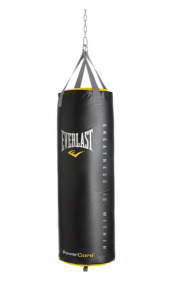 This Everlast punching bag comes with heavy duty nylon straps and an adjustable chain. Hanging punching bags, unlike free standing bags, are good for working on things like speed, timing, range, footwork and accuracy. This bag can also be anchored to the ground. The Everlast C3 Foam Heavy Bag is ideal for cardio training; however recreational users should be weary of the bag’s hardness as it may be too hard for people who don’t train a lot. The Everlast Powercore Nevatear Training Bag comes in two sizes, 80 lbs and 100 lbs, which are pretty standard punching bag sizes. The bag looks great and is constructed with a webbed matrix of synthetic leather and vinyl and is accented with bright yellow canvas from the top and bottom. The bag comes pre-filled with synthetic and natural fibers, which Everlast touts as being very good for punching/kicking absorbency. 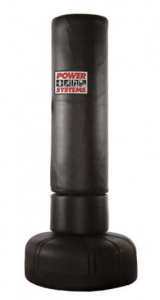 The main feature of this punching bag from Everlast is the Powercore center, which is made up of four 5 pound sandbags aligned by metal rivets. This allows for the upper section to have the give of a poly canvas bag, while keeping the stability of a stiffer bag. That is to say that it will not swing wildly. This makes it ideal for training power punches at the upper level. It should be noted, however, that this added feature means that the bottom of the bag will become rock hard with repeated use so punching or kicking the lower portion of the bag unprotected should be avoided. 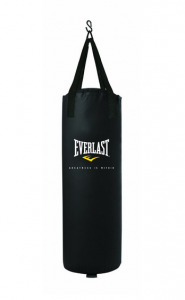 Like other Everlast punching bags, this bag comes with an adjustable chain and nylon straps to hang the bag. This bag can also be anchored to the ground. 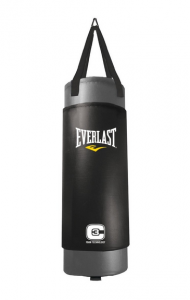 The Everlast Black Powercore Nevatear Heavy Bag is an excellent choice for trained fighters and recreational users, as long as caution is taken not to hit the bottom of the bag. 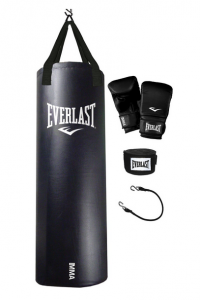 The Everlast 70 Pound MMA Kit consists of a polycanvas heavy bag, a pair of hand wraps, and a pair of bag gloves. The bag in this package is lighter than the MMA bags that are generally in a gym. This is because a gym needs to accommodate people with a wide range of skills and sizes. 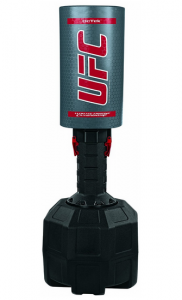 The Everlast punching bag comes filled with Everlast’s special blend of synthetic and natural fibers, which provides very natural shock absorbency levels. There is a decent amount of give when you hit this bag, which can help you avoid injury. This is important for people who are working on their kicking techniques as the give from the bag will be more accommodating. This bag comes with an adjustable chain and heavy duty nylon straps that are used to hang the bag. A hanging bag provides a moving target, which allows the fighter to work on their range and timing, as well as footwork and accuracy. 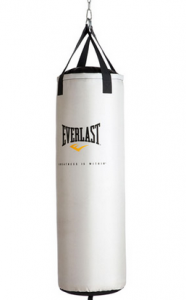 This Everlast bag is a great size for training children, as well lighter people, as it provides much less resistance than other punching bags. However, it would not necessarily be an ideal punching bag for training heavier fighters (160 lbs and up), who would require a heavier bag in order to properly develop their power. It is, however, a good size for wrestling drills that involve lifting and carrying training bags over any distance.